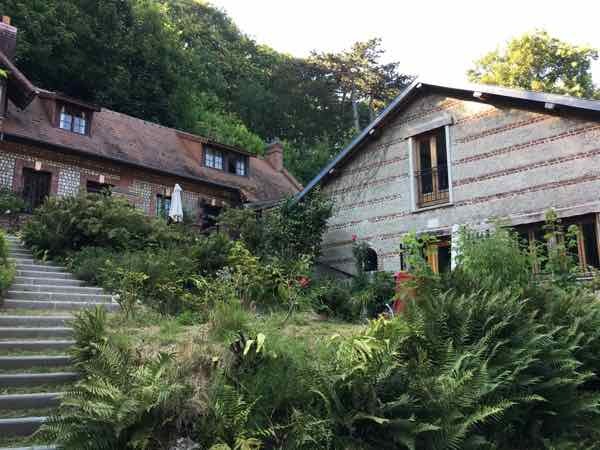 I recently enjoyed my first Airbnb in Normandy and I have 3 insights into how you can make sure your stay is a success. 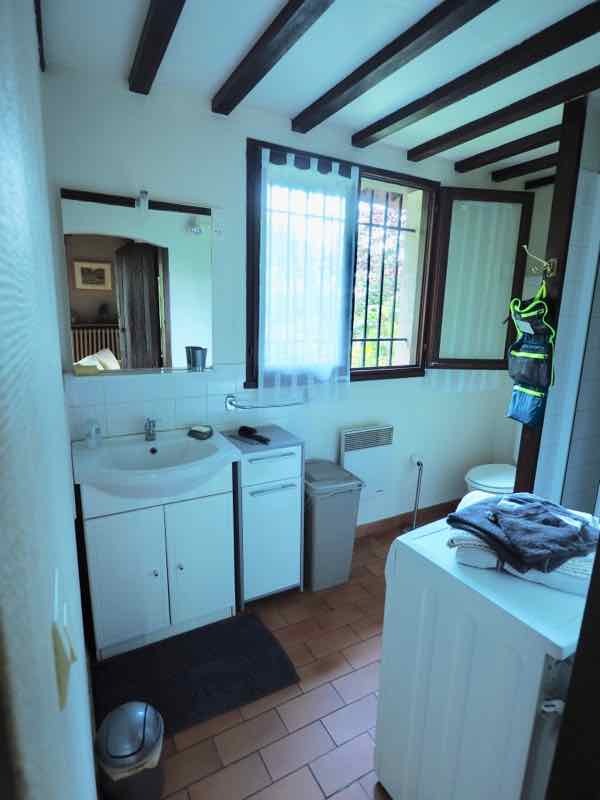 I know I lucked out with the house I rented in Etretat. 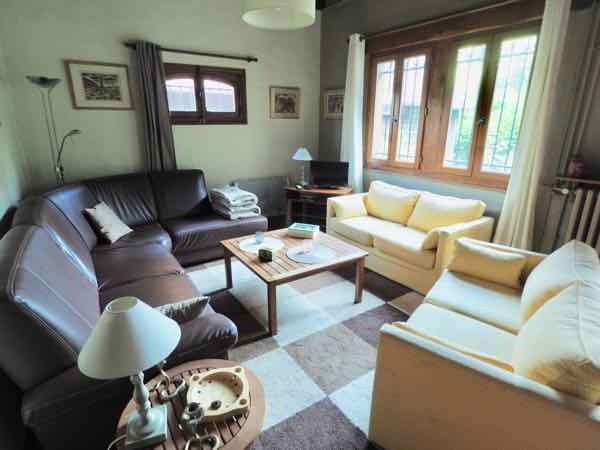 Up until now, I had rented self-catering accommodations via websites like VRBO or through Gites-de-France. But as everyone knows, Airbnbs are becoming so popular so I wanted to try it out. 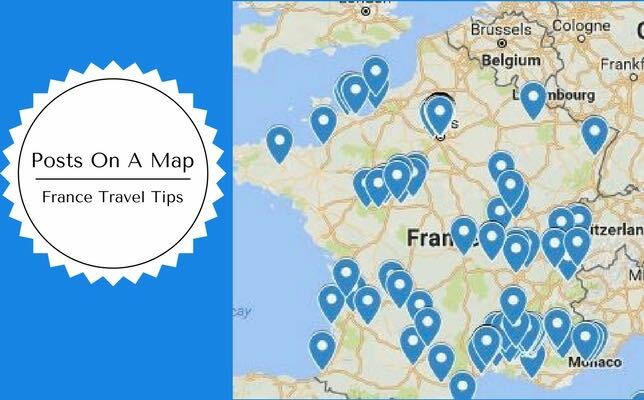 If you’re heading to Normandy, I would highly recommend you consider renting a place in Etretat. While there are so many beautiful towns along the French coastline of Normandy where I could stay, Etretat was the place I wanted to be. 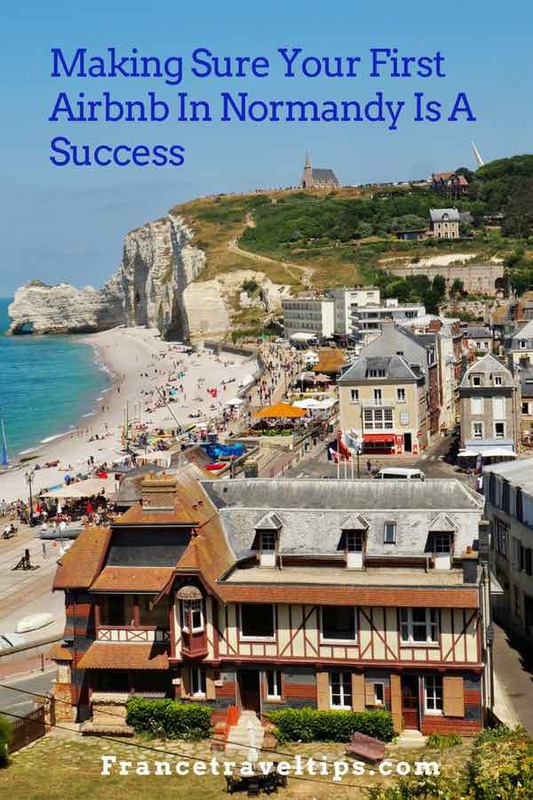 Etretat is the “hub” of the Côte d’Albâtre and it has a number of hotels, and if you read last week’s post, you know the cliffs at Etretat are the main attractions. As my primary goal was to see the cliffs, Etretat was pretty much the only town I seriously considered. I had visited Honfleur many years ago, but it was at least an hour away and is overrun with tourists (even more than Etretat). I thought about staying outside of Etretat; however, this would mean I’d possibly be driving there (to see the town or the cliffs) more often. There’s something nice about being near all the action and not having to drive all the time. 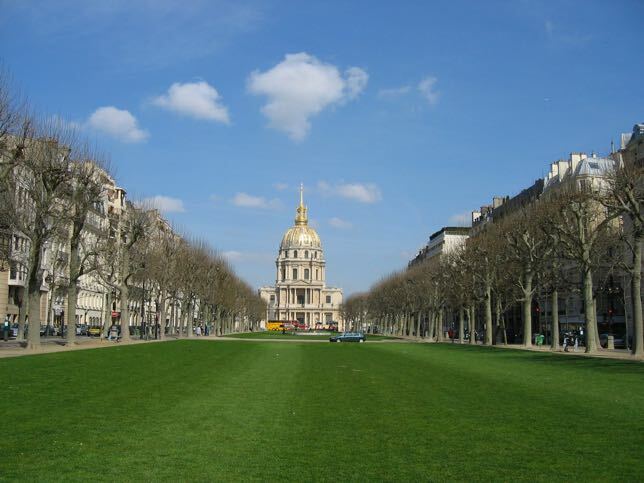 In Paris, recently, the city has clamped down on “illegal” Airbnbs…units for rent by owners who are not registered (with the city) or who are not playing by the rules. As a result, soon after the announcement was made, many renters were suddenly informed (ie. day before they arrived) that their Airbnb no longer existed. It was removed from the list and they’d have to find alternative accommodations. I really wasn’t sure if this was a problem in Etretat. I had read various reviews from very unhappy renters whose booking was suddenly canceled….even within a day and week of arriving. This was done by the host and although Airbnb would help out the guest, as with most things in life, if you leave your booking to the last minute, you won’t have much to choose from AND the price will be higher. So I did not want to be put in this situation and decided that if I was going to rent through Airbnb, I would choose one that had NO cancellations (by owner) and that the host had many positive reviews. 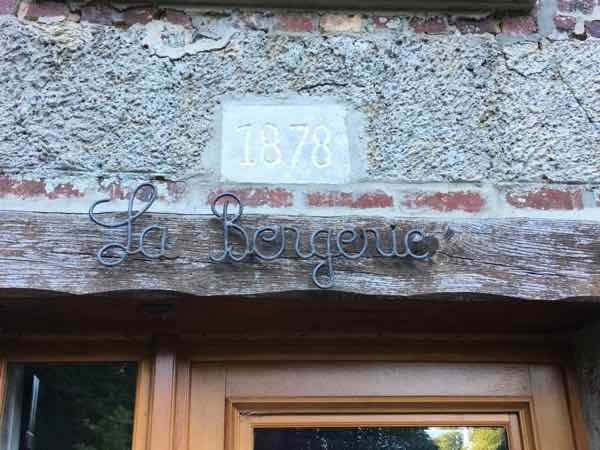 In my booking, I gave a brief description of myself and booked the house, called “La Bergerie” (In English it literally means sheep pen or barn and this house used to be a farmhouse). The cost included an Airbnb fee and there were no additional costs like a cleaning fee. My rental was a 1 bedroom French cottage (2 beds) with everything that met my criteria, including a full kitchen and free parking. Total cost for 7 nights: $905 Cdn, an outstanding deal considering it was the second week in July. The house was located adjacent to the owner’s house and it was built in 1878. It was old but not run down. And for those who know me well: no bugs!!! The inside of the house was large and spacious and had three floors. The ground floor had a bathroom (with a shower and washing machine), a dining room, and a large living room with a television (and cable). At the end of the day, I often hung out in the living room, uploading my photos and watching the FIFA World Soccer. The house did not come with Wifi but it didn’t matter as I had my own hotspot and internet. The next floor up had a kitchen with a window and door leading to the side of the house. It was fairly well stocked with condiments and coffee left over from the previous guests. 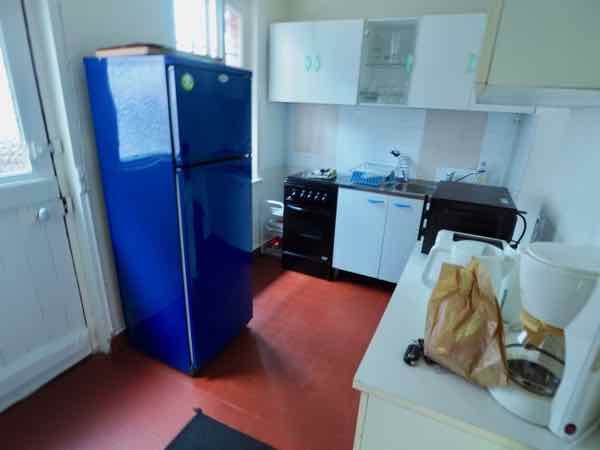 How do you like the blue fridge?! Finally, the top floor had a desk, two beds, and a wardrobe. When I opened the window and balcony doors, I got a perfect breeze. The owner, Séverine is a designated “Superhost” with Airbnb. Superhosts are experienced and provide exceptional hospitality. They have reached a level where they get the “Superhost” badge/designation (ie. evaluated every 3 months, meet certain performance standards such as prompt responses, high ratings, and with more than 10 stays per year). My positive impression of Séverine began well before I even arrived. I had sent her a message stating that my birthday was on Bastille Day (La Fête Nationale) and asked if she could recommend any restaurants. She mentioned that there were fireworks on July 13 in Etretat and fireworks in the nearby town of Le Havre on July 14 and also gave me some restaurant recommendations. We messaged each other a few times and she was so kind in even providing me with the name of a different restaurant as she had heard that the owners of one had changed ownership and the food wasn’t that good anymore. When I told her that the Golf d’Etretat Restaurant wasn’t taking any reservations on July 13, she actually called them to get clarification and wrote back to me that there was a private party. She went out of her way to help me and was so friendly in her messages which were in written in French. While I can read most French, Airbnb will translate the message for you if you need it. 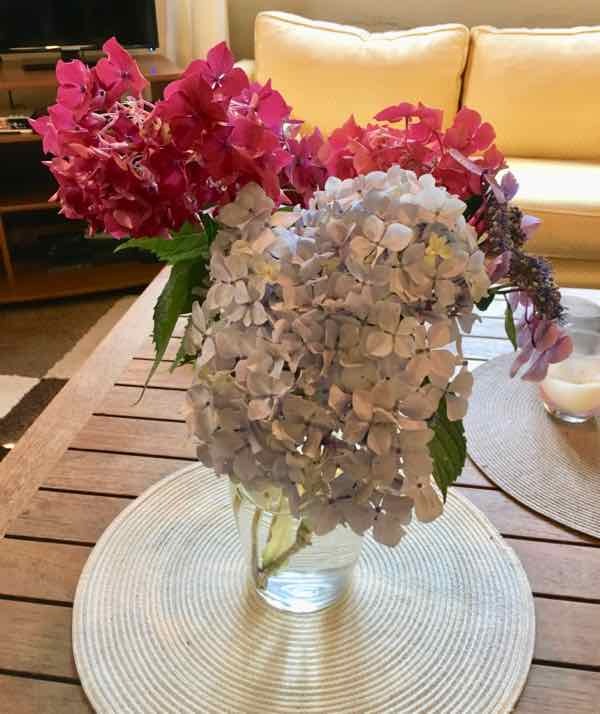 To top it off, on my birthday, Séverine gave me some flowers from her garden! How sweet is that! The Airbnb was located just on the edge of Etretat and it wasn’t until I arrived did I discover how great the location was. I often just left my car at the house and walked into town to see the falaises or go for dinner. When I arrived in Etretat, although I had “rough” instructions as to the location, I did have to call Séverine for help. She only spoke French and thank goodness my French was good enough for her to understand me (and visa versa). I quickly found her house and my rental (side by side) and after unloading my luggage, Séverine took me on a short tour to show me the important spots near the house, such as the short cut into town, and the Dormy House Restaurant just around the corner. 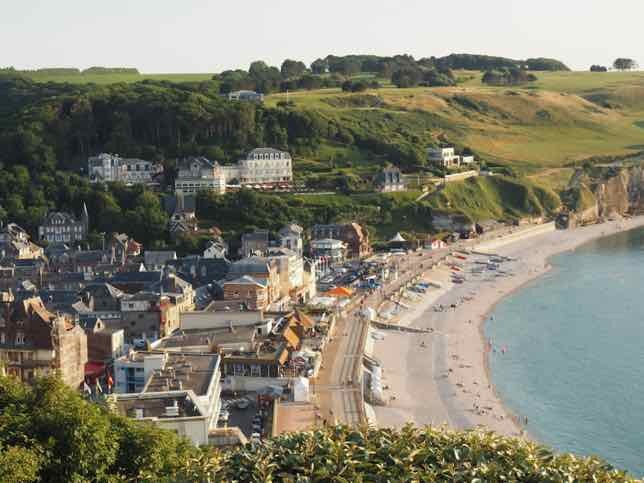 It had superb views of Etretat and she said having lunch, dinner, or even a drink there would be worthwhile. During my week (see Itinerary #31), I did take up a number of her restaurant recommendations in Etretat which I will write about in a future post. One involved a lunch with a fabulous view of Etretat and the other was my pre-birthday pre-Bastille day dinner by the beach prior to watching the fireworks. I highly recommend that you try out Airbnb for your next holiday. 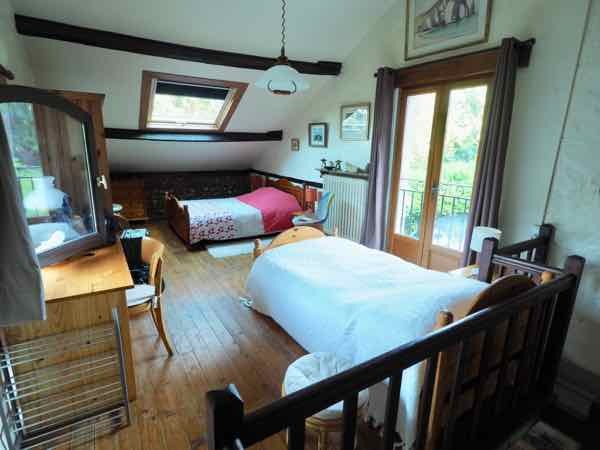 My first Airbnb in Normandy was perfect and yours can be too! Jan is this central for visiting Normandy Memorial? 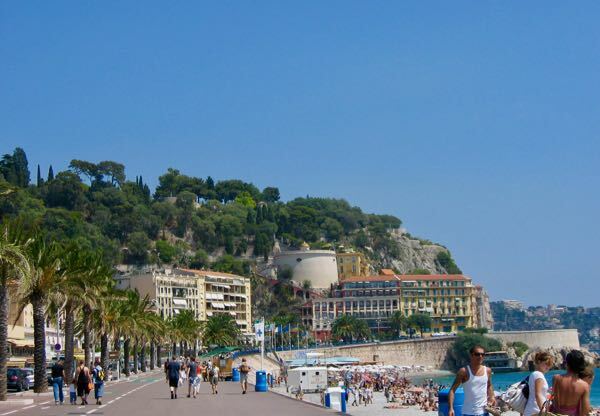 we also want to go to Monte St Michel is it close? If you are referring to the D-Day memorials near Caen, it’s north-east of there (1.5 hours, 120 kilometres), which is why I never visited Etretat during my first trip. I concentrated on the area near and south of the D-Day beaches. Normandy is a wide area. Depending on how much time you have, you could possibly do both sections of Normandy but it just depends on your time. Mont St. Michel is even further west than Caen (2.5 hours from Etretat). That’s a lot of ground to cover.